January 2017 – Page 79 – Welcome to Wyandotte Daily! RideKC and the Unified Government transit services will observe Monday, Jan. 2, as the New Year’s Day holiday. RideKC and the UG buses will be on the Sunday and holiday schedule today, according to an announcement. Regular weekday service will resume Jan. 3 for KCATA and the UG transit buses. For more information about bus service, visit www.ridekc.org or call the Regional Call Center at 816-221-0660 weekdays from 6 a.m. to 7 p.m.
Areas of drizzle and areas of fog are in the Monday morning forecast, according to the National Weather Service. Fog is possible between 8 a.m. and 1 p.m., the weather service said. The high will be near 53 with a southeast wind of 6 to 8 mph. Monday night, there will be a 40 percent chance of rain, mainly between 7 p.m. and 3 a.m., according to the weather service. The low will be around 32. A light and variable wind will become north northwest 10 to 15 mph after midnight. Winds could gust as high as 23 mph. Tuesday there will be a high of 33 with partly sunny skies, the weather service said. Temperatures will fall to around 30 by 5 p.m. A north northwest wind of 11 to 14 mph may gust as high as 23 mph. Tuesday night, the low will be around 14, with a north northwest wind of 9 to 11 mph, according to the weather service. Wednesday, it will be mostly sunny with a high near 25, the weather service said. Wednesday night, expect a low of 12 with a 20 percent chance of snow after midnight. 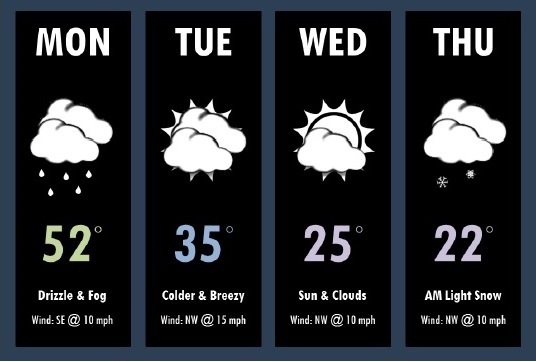 Thursday, the forecast is partly sunny with a high near 22, according to the weather service. Thursday night, the low will be around 11. Friday, it will be mostly sunny with a high near 30, the weather service said. Friday night, the low will be around 13. Saturday, the high will be near 30 with mostly sunny skies, according to the weather service. Saturday night, it will be mostly clear with a low of 15. Kansas City, Kan., firefighters responded to a house fire on Dec. 30 in the 5100 block of Locust Avenue. When they arrived, firefighters reported seeing heavy smoke and fire coming from the rear of the building, according to fire officials.